Trumpeter Ralph Alessi is one of the most respected composers and instrumentalists in modern jazz. 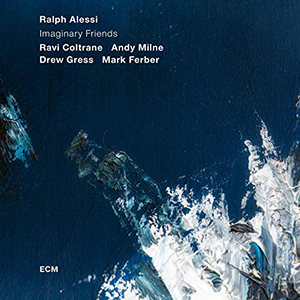 His tenth album Imaginary Friends marks the ECM debut of his long-running working quintet: Ravi Coltrane on saxophones, Andy Milne on piano, Drew Gress on bass and Mark Ferber on drums. The brassman pulls off a neat trick on this record: being faithful to jazz tradition whilst not falling to the traditionalist trap. Check out “Improper Authorities,” on which Alessi and Coltrane trade long, interwoven lines as the rhythm section swings in the style of a passing train, while Milne interrupts the proceedings with choppy chords – it’s quintet jazz of a classic bent, twisted just enough to spark recognition while making it impossible to pinpoint. Like a choice Dave Holland track, “Fun Room” keeps that vibe going, with an easy swing, tight unison riffs from the hornmen and a tune just this side of dissonant. “Iram Issela” – Alessi’s daughter’s name backwards – leans in on its melody, with Coltrane contributing a particularly luscious solo, then locking horns with the bandleader to bring the track home. “Pittance” opens up the sound, with the musicians laying back to the bare minimum and Alessi taking command of the spotlight with some impressive runs. “Around the Corner” and the title track set aside rhythmic drive for a more inquisitive feel, allowing the musicians to explore space with their turns of phrase for atmospheric performances that engage with close listening. The group really cuts loose on “Melee,” which, on the first half, gives everyone a chance to push themselves past the changes and into freeform instrumental exploration, before coming together on the second for a unified front of collective improvisation. The leader closes out the album with “Good Boy,” an incandescently beautiful duet with Milne. Alessi has an ear for variety, incorporating elements from swing to free jazz, but his strong identity as musician, composer and visionary makes Imaginary Friends sound like it could come from no one but himself.